Is there an outbreak of a drug-resistant strain of salmonella that's contaminating turkey right before Thanksgiving? We verify these online claims. Author: Jason Puckett, Terry Spry Jr.
Just days before Thanksgiving, a salmonella outbreak has many worried about the turkey at the center of their meal. Posts online say that a drug-resistant strain of salmonella has caused hundreds of people across the country to fall sick after eating turkey. A viewer asked us about the safety of eating turkey this holiday season, so we wanted to verify these claims. Is there an outbreak of drug-resistant salmonella in turkey products? Could I become sick from my Thanksgiving dinner? Yes, there is a nationwide salmonella outbreak and yes, it is stemming from raw turkey. No, that doesn't mean you have a greater risk of food poisoning than you would eating turkey at any other time. As long as you prepare your food properly, the dangers should be minimal. 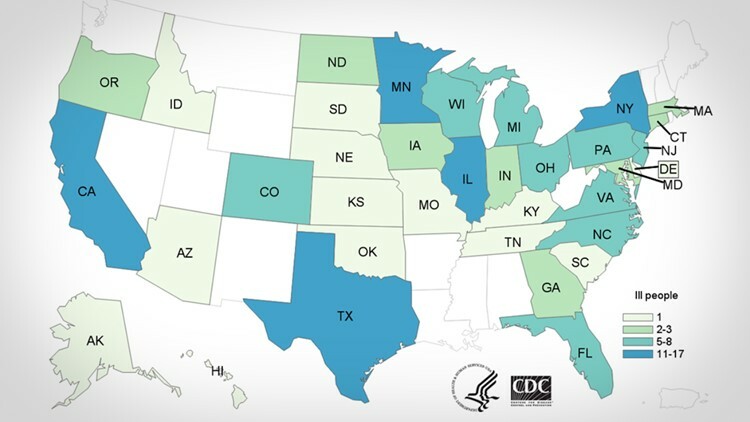 As of the most recent CDC data from November 5th, 164 people across 35 states have been infected with Salmonella Reading. Of those 164 people, 63 were hospitalized and one person in California died from his infection. The CDC have a list of affected states on their website. On Nov. 15, the USDA ordered the recall of more than 90,000 pounds of raw turkey product from Jennie-O Turkey Store Sales, LLC. While the Jennie-O facility was found to have contaminated turkey meat, the USDA’s Food Safety and Inspection Service doesn't believe that it is the only location effected. It has stated that more brands of turkey products may still be recalled. Salmonella Reading was found to be resistant to multiple antibiotics in a CDC test. But, the CDC said, the most common antibiotics used in treatment are still effective. “This resistance likely will not affect the choice of antibiotic used to treat most people,” the CDC wrote. Unless you undercook your turkey, you shouldn't be concerned, although it's still best to avoid the recalled products. ✔️ Cook all the way through to 165°F. ✔️ Carve the meat off & store in small shallow containers. The USDA recommends that turkeys always be cooked to an internal temperature of 165 degrees. Doing so should kill any Salmonella present within the turkey. The CDC adds that you should wash hands after preparing raw meat, including turkey. While it is not recommended to wash turkey prior to cooking, you should wash counters, cutting boards, and utensils that touch raw turkey. Finally, it’s not recommended to give your pets raw meat. You can contract Salmonella by handling pet food with raw turkey in it. Perhaps the most important note in this story - is that salmonella can be present in turkey even without an outbreak. Information about a salmonella outbreak was released by the CDC on Nov. 8, but there was no mention of any specific turkey brand attached to the outbreak until a week later. Why did it take so long for the CDC to identify the turkey as Jennie-O brand? The delay was due to difficulties pinning down a source of the outbreak. According to the CDC, Salmonella Reading may be present in both live turkeys and raw turkey products. As of the writing of this article, a single, common, source of the salmonella outbreak has not been identified. So far, the CDC have linked the outbreak strain to 29 different slaughtering and processing plants. Jennie-O’s parent company Hormel Foods Corp. told the Associated Press they owned five of those plants. The USDA identified Jennie-O turkeys by testing samples from an infected patient’s home.